The Witch's Island: Okay, How About This one? Hubby is still seething about our experience with the local Dodge dealer. Just by writing these words I can see the steam starting to rise off the top of his head. But all should calm down soon (hopefully). We dropped by another local dealer's lot on Saturday while we were out to do some Christmas shopping and we found a nice, clean, low-mileage truck like the one in these two pictures. 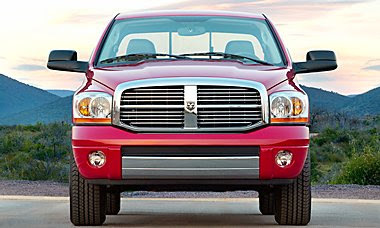 While these are stock photos from Daimler Chrysler via off-road.com and about.com ours looks just like them. The spec.s are good - 5.7 litre HEMI, Quad Cab, 4 wheel drive, 20 inch alloys, power everything - and the price is reasonable. It even fits into the garage, we know because we tried it out. They have offered a decent price on our old truck although they haven't seen it yet. The people we have dealt with at the dealership have been much more pleasant to work with, too. If we can agree to a couple of small things we will probably bring this home this week. Say a prayer for us! Prayers and positive thoughts are being sent in your direction!! I know all too well the frustration you and your husband are going through and so I will hope for a happy ending!! Hang in there!! is it red like the one in the photo? I love it and a Merry Christmas to you and your dh, I guess you've been a good boy and girl this year!! Thanks to Kim and Gill for your kind words of encouragement. 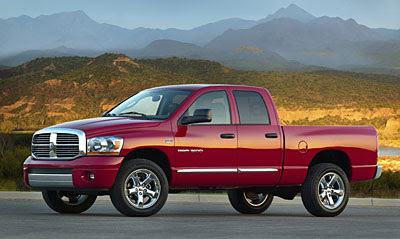 And yes, it is just like the one pictured except that it also has chrome bedrails and running boards. Otherwise it is just as you see, same colour and wheels.